Theresa May's chief whip, first elected to Parliament in 2010, wasn't among the bookmakers' favourites for the Ministry of Defence vacancy.The South Staffordshire MP has no military background and had little opportunity to build up a public profile because his role in the whips office meant he did not speak in Parliament. Raised near Scarborough by Labour-supporting parents, he ran a Staffordshire pottery firm, making and selling ceramic tableware, before becoming an MP.After entering Parliament, Mr Williamson was given a role in the Northern Ireland Office in 2011, and then became David Cameron's backbench aide. He was appointed a CBE in the ex-PM's controversial resignation honours list, telling the Stourbridge News he was "extremely honoured and humbled" at the award.And he didn't fall out of favour as Theresa May took over in July 2016 - "literally walking out with one prime minister and in with the next" in the words of friend and fellow Tory MP James Wharton. 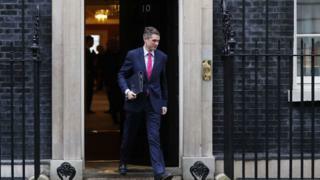 After a disappointing general election for the Conservatives, he played a key role in brokering the ?1bn deal with the DUP to prop up their minority government.But until now, that tarantula might have been the most commonly-cited fact about the 41-year-old - whose successor as chief whip tweeted a picture of his desk on taking over. He has described the creature, known as Cronus, as "a perfect example of an incredibly clean, ruthless killer" - who reportedly fell foul of the strict rules about animals on the Parliamentary estate.Kate Moody, who sold it to him at his local garden centre, told BBC Radio 4 the MP had thought it would be a "great addition" to his office.She recalls Mr Williamson joking that he was having a "mid-life" crisis when he bought the red-legged Mexican tarantula, saying "it was a sports car or a tarantula and the tarantula won". And spiders aren't the only animals close to his heart - he's also a patron of the World Owl Trust and has built a house for hedgehogs in his garden.He might be kind to animals, but there was a hint of a less accommodating approach in his speech to the Conservative Party conference as he described his methods in the whips office. "We take a carrot and stick approach," he told delegates. "Personally I don't much like the stick, but it is amazing what can be achieved with a sharpened carrot." On being appointed as chief whip: "I was absolutely flabbergasted, but I accepted immediately." On his pet tarantula: "You have to look at all different ways to persuade people to vote with the government and it's great to have Cronus as part of the team"
In the Commons: "It's very important to use our gardens which are a specific habitat for hedgehogs. Just recently in my own garden I built a hedgehog house. Sadly I have no residents in it but hopefully it will encourage them and the growth of hedgehogs in South Staffordshire." "Gavin Williamson played a pivotal role in delivering a majority for the government in the House of Commons." The DUP's Jeffrey Donaldson.